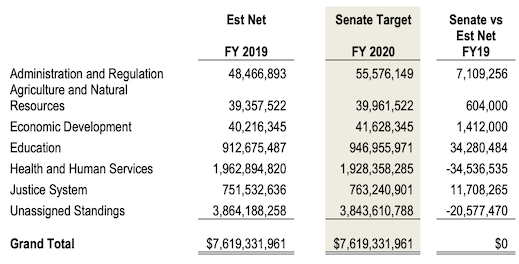 Today, Senate Republicans released their budget targets for FY 2020. The overall budget of $7,619,300,000 is the same amount of funding allocated in FY 2019. These targets are $48 million less than the House and $39 million less than the governor. These budget targets include $38.8 million in additional tax relief in FY 20. The targets also include nearly $130 million in new funding for education, $14.5 million in new funding for public safety, and $106 million in new funding for health care. The decrease in Unassigned Standings is because the increases in the FY 20 budget are less than the $113 million cash reserve repayment that is not necessary in FY 20. Reductions in Health and Human Services are because of one-time expenditures in FY 19 on Medicaid and an increase in federal funding for that program. Senate Majority Leader Jack Whitver released the following statement regarding the Condition of the State remarks from Governor Reynolds. “I applaud Governor Reynolds’ positive vision of Iowa. The policies enacted over the last two years have made Iowa the Number One state in the country. Senate Republicans will continue our partnership with the governor to implement bold, pro-growth policies to build on that success. We will keep our focus on expanding career opportunities for Iowans, enabling them to keep more of what they earn, and making Iowa the best state it can be. Senate President Charles Schneider’s opening day remarks as prepared. Welcome to the First Session of the 88th General Assembly. I would like to offer a special welcome to the new members of the Iowa Senate – Senator Whiting, Senator J. Smith, Senator Nunn, Senator Celsi, Senator Koelker, Senator T. Taylor, Senator Wahls, Senator Miller-Meeks and Senator Cournoyer. It strikes me the new members hold almost 1 in 5 seats of this body. This is a positive sign that Iowans are willing to give their time and talents at the state Capitol in the service of their neighbors. While this is a sacrifice for some, especially those who come from the far corners of our state, I can speak for those who have served in this chamber before when I say it is also extremely humbling and a unique honor to serve the people of this state in the Iowa Senate. I wish you all the best during this General Assembly. I am proud to say Iowa is thriving. Our state boasts the lowest unemployment rate in the country. Thanks in part to the reforms passed during the last General Assembly, Iowans’ incomes are rising, their taxes are shrinking, and our economy is growing. Most of you have probably heard that US News & World Report ranked Iowa the #1 state in the country. This recognition is something we should all be proud of. After all, it didn’t come about because of one General Assembly. It is something that we have worked on collectively over many years, and through split control of government. Being #1 doesn’t give us the freedom to rest on our laurels. Iowa may be the #1 state in America today, but the other 49 states are looking for opportunities to make their states more desirable. Becoming the best hard, but it’s more difficult to stay there. Being #1 does not mean that we have achieved perfection. We still face many challenges: brain drain; workforce training; improving our business climate; improving student achievement in education; enhancing our quality of life. Most of us would agree that these are all areas that need our attention. I believe we are up to the challenge. Addressing some of these challenges means getting government out of the way. Taxes that hinder growth will result in fewer jobs, lower incomes, and less economic development. We need to find ways to continue to reduce the tax burden on hardworking Iowans – particularly when it comes to property taxes, which have an unfair, disparate impact on Iowans who live on fixed incomes, like many seniors. Regulations and job licensing requirements can go too far. Some regulations and requirements are necessary for public health or safety reasons. But if they go too far, they can trap the unwary in debt and discourage people with ambition from taking a chance to start a business or a new career, crushing the American dream. Addressing some of these challenges requires government involvement. We must continue to invest in education and workforce development if we want to ensure that all Iowans are able to share in the state’s success. We must ensure we have a safety net for those who are most in need. As we make these and other investments, we need to remember that taxpayers expect us to use their tax dollars wisely. Doing so requires setting priorities. I look forward to working with my colleagues in the Senate, and with the House and Governor Reynolds, to address these challenges. It won’t be easy, but I have faith in our ability to overcome adversity. Part of my faith lies in our proud tradition of being a true citizen legislature. In this chamber today, virtually none of us is a career politician. Many of us leave our regular occupations as farmers, teachers, lawyers, or business owners to serve in the state capitol. We know that we need to get our work done so we can return to our normal lives. I hope this means the Iowa Senate can operate without the harsh partisanship that is infecting our current political discourse. For too many politicians, politics has become a sport. Some politicians focus on supporting their own team, or furthering their own ambitions, rather than shaping good public policy. When that happens, discourse suffers. As we all know, it is a violation of a long-time Senate rule to question the motives of another senator on the floor. The rule justifiably recognizes what we sometimes forget – every senator deserves the benefit of the doubt when it comes to his or her motives on an issue. I believe that every person here decided to run because they have the best interests of their constituents in mind. I believe that is what drives the passion each of us has for the work we do here. I hope we can all aspire to keep this in mind as we go through this legislative session. As elected officials and leaders of our state, we have a responsibility to bring people together. The time for drawing contrasts is over. The time to govern has arrived. We are all Iowans. We are all here to make our state a better place for our families, neighbors and communities. Now is the time to come together and focus on Iowa’s future. I wish everyone in this chamber, including the staff, clerks and pages, a happy, healthy and productive legislative session. I look forward to working with all of you to continue the success of our state. Today, Senate Majority Leader Jack Whitver, R-Ankeny, released committee assignments for members of the Iowa Senate Majority for the Eighty-Eighth General Assembly. Whitver was elected to the Iowa Senate in 2010. He was chosen by Senate Republicans to preside over the Senate as President in 2016 and became Majority Leader in 2018. On Tuesday he was reelected to a four year team to represent Ankeny, Alleman and a portion of northeast Des Moines in the Iowa Senate. He resides in Ankeny with his wife, Rachel and their three children. Schneider lives in West Des Moines with his wife Lisa. He was first elected to the Iowa Senate in 2012 to represent West Des Moines and Waukee. He was elected President of the Senate in 2018. I would like to start by saying it is a great honor to serve as president and presiding officer of this body. The Iowa Senate is a made up of some of the best people our state has to offer. Each Senator in this chamber worked hard this legislative session to represent their communities to the rest of the state. Today, the legislative session ends and we return to the “citizen” part of being a citizen legislator. We return to towns like Council Bluffs, Dubuque, and Independence, proud to have done our part to serve our constituents. Each of us ran for election to the Iowa Senate for our own reasons. But we share a common goal – to make Iowa the best state in America to live, work, and raise a family. One of the main reasons I ran for office was to transform our state from one that continues to lose people and wealth to other states into one that is a magnet for both jobs and the people to fill that demand. This session, we made great strides toward achieving this goal by passing the most significant tax reform in the history of our state. The opportunity to overhaul our tax code does not come around often. So we aimed high. Our goals were to simplify our tax code, modernize it for a 21st century economy, make our state more competitive, and allow Iowans to keep more of their own money. I am proud to say the reforms offered by the Senate Republican caucus delivered on these goals. The tax relief bill we passed provides $2 billion in tax cuts over the next six years. Once fully implemented, it will drive down rates for individuals, farmers, and employers. It will make it easier and less time consuming for the average Iowan to file a tax return. It will improve our ability to compete against other states for economic development opportunities. And, it creates more upside opportunity for entrepreneurs who leave their job to start a business, agree to take over their family farm, or commit their life savings to take on their dream venture. Tax reform is a win for Iowans and I’m proud the Senate Republican caucus delivered. In addition to serving as the President of the Senate, I am proud to serve as the Chair of the Appropriations Committee. Iowa’s state government should thoughtfully consider every dollar it spends. Iowans expect that of us. This year, we passed a budget that is both responsible and funds our priorities. Iowans across our state get up early, work long hours, and sacrifice their time and talent for benefit of their families and their communities. Iowans work hard for every dollar they make, every penny they earn. The very least we in this building can do is be good stewards of the dollars they send to the state. In November 2016, Iowans decided they were tired of business as usual. They voted for a change. They voted for an Iowa where people have more money in their pockets. They voted for an Iowa where the laws of the state reflect the values of its citizens. Our plan a year and a half ago was no secret. And, our goal four months ago was no different. Our objective was as simple as it was audacious – to make Iowa the best state in America. This was not going to be just another General Assembly. I am proud to be a part of the most consequential General Assembly in the modern history of our state. Though our work is not done, I am confident the bills we passed this session will make our state a better place to live, work and raise a family. Before we adjourn, I would like to wish everyone a safe, healthy and prosperous summer. Thank you for your hard work on behalf of your constituents and our state. God bless you and your families. And, God bless the great state of Iowa. President Schneider, Senate Minority Leader Petersen, colleagues and friends, I stand before you very proud that we honored the bold commitments we envisioned at the start of this Legislative Session. We came together to ease the tax burdens on hard-working Iowans, provided new access to affordable healthcare for Iowans in need of coverage, enhanced our mental health system, made steps to continue improving our water quality, work toward developing and expanding our skilled workforce and maintained our commitment to revitalize rural Iowa. On a personal note I want to thank everyone for their support and encouragement this Legislative Session. I delivered my opening remarks as the Senate President and today deliver closing comments as a Senate Majority Leader, who is proud of our caucus for their dedicated commitment to their constituents, the state of Iowa and their fellow Senators. Despite challenges that we encountered this session, they remained focused and did not lose sight of why they are here – to do the people’s work. Colleagues, we adjourn today able to go home to our districts and tell our constituents we kept our word, honored our commitment to them and produced historic results that will help our state forge a path of success for future generations. That starts with tax reform. Tax reform is something we stood up to talk about for years during our time in the minority, and pledged to accomplish when given the opportunity to govern in the majority. I am proud of the tireless dedication of Senate Republicans to see through with this promise. We never wavered on our commitment on making tax reform happen. This is something Senate Republicans and I spoke about repeatedly during my entire time at the Capitol. When it came to giving hard-working Iowans a tax break, we did not stand up to speak to hear ourselves talk. We rose to speak because we believe this is necessary. We spoke about this passionately because we want to see our great state grow. We stood up for those whose pleas for help fell on deaf ears for nearly two decades. Simply put, we made our vision a reality to lend a helping hand to an overwhelming majority of Iowans, and unleash limitless opportunities for years to come. Iowa families deserve to have more of their hard-earned money in their pockets. Though it took 20 years to fulfill our pledge, we leave here today able to say we accomplished what we set out to do this General Assembly. On the first day of this 87th General Assembly, I encouraged my colleagues to think big and act boldly. I knew if we dared to dream big the legislation we passed would positively impact our state and set the course for an economic revival in Iowa. We came here every day with the goal of keeping our word to the voters who sent us here. Promises made, promises kept. Passing tax reform is a giant step in that economic revival as it plays a significant role in helping us compete with neighboring states. This bold initiative not only helps draw new people into our state, but it also rewards hard-working Iowans by providing them with more resources to prosper and live comfortably in their communities. Over the last two years, we worked to expand our workforce, strengthen our economy, rejuvenate our Ag industry, ease the tax burdens on Iowans, create financial stability for our rural communities and school districts, and provide students with a top-notch education. As we bring a close to this 87th General Assembly, I stand before you proud of the work we have accomplished on behalf of Iowans. Though we did not always see eye to eye on policy; it is hard to argue the positive results that it generated for the future of the state we love. We can all agree that Iowa is the best state in the country. Now, people outside of Iowa are beginning to understand what we have known for years. My friends, we find ourselves at a defining moment in our great state. We can make the decision to go backward and hope better days lie ahead, or we can put our strong Iowa work ethic to the test to continue forging a path for economic growth and prosperity. We have made great strides in the last two years, but our work is far from finished. Senate Republicans remain committed to finishing what we came here to do: Improving our business climate, making education a priority and working to create new career opportunities across this great state. In closing, I want to thank my Senate Republican colleagues, Senator Petersen, the Senate Democrats, the Senate Republican and Democrat caucus staffs for putting in so many hours researching bills and helping to keep us informed, the staff in my office, staff in the Senate President’s office, the Secretary of the Senate and his hard-working people and the sergeant at arms, our door keepers, Randy Wallace and everyone who makes a Legislative Session successful. It is an honor to work with all of you. It’s a great day to be an Iowan; let’s work to make tomorrow even better. Thank you. Comments from Senate Majority Leader Jack Whitver as prepared for delivery are below. Friends and colleagues, I rise today to say thank you for the honor to serve as President of the Iowa Senate for the past year and a half. I am proud to be fair and impartial as I presided over this body. Today, I rise to speak in a new role. I want to thank my colleagues for the confidence to help lead our Republican caucus going forward as Senate Majority Leader. Though the office, title, and responsibility have changed – the goal has not. I ran for office 7 years ago to make Iowa a better place. I wanted to be a part of a new group of leaders who were willing to look beyond the next election, and look to the next generation. As a father of three young children, I have only one agenda. It is not a Republican agenda or a Democrat agenda. It is an Iowa agenda. It is one that ensures our kids and our grandkids have more opportunities than we have had. I know all of us – regardless of party – have the same goal for Iowa – to be the best state in the nation! Though we may differ on that path – we cannot disagree on the result. We have made a tremendous amount of progress! As we all know, Iowa was recently ranked Number 1 in the US News overall state ranking. We rank Number 1 in infrastructure, Number 3 in healthcare and Number 5 in education. While we have made great strides, there is always room for improvement. We must continue to promote and pass policies that make Iowa a place where our residents want to stay, work and raise their families as well as be a place to entice future Iowans to call home. I look forward to a seamless transition as we continue work on our priorities. I look forward to passing a tax reform bill that reduces taxes on hard-working Iowans. I look forward to passing a Future Ready Iowa bill to ensure we have a workforce prepared for the 21st century. I look forward to passing a fiscally sound and balanced budget in the coming weeks. And, I am extremely excited to continue our goal of making Iowa the most job-friendly state in the nation. As a former football player – I often heard it is much easier to get to the top than to stay there. I challenge this body to continue to make the tough choices necessary to stay at Number 1! Thank you again for the confidence to lead, and I look forward to working with each and every one of you to ensure Iowa remains a model for 49 other states to follow! Today, following his oath of office, Senate President Charles Schneider offered the remarks below, as prepared for delivery. I am honored and humbled to preside over this fine deliberative body. The Iowa Senate is the embodiment of the ideals of our founding and the principle of a representative, federal republic exists within these walls. I’ve proudly served the 22nd district for the last six years. Now, it is an absolute honor to not just be able serve my district, but all of you who represent the entirety of the state of Iowa. I am humbled that my colleagues have entrusted me to step into the crucial position of President of the Senate and I look forward to rising to the expectations placed upon me. We each stand here today because our constituents have trusted us to be their voice in this chamber. Although members of this chamber have transitioned to new stations of leadership, the core of our leadership stays the same. We are here to lead on behalf of our constituents. The citizens of Iowa sent us here to make good on the promises we made to them during our elections and we have listened to them. Our agenda relies on our constituent’s commitment and support and because of this support we have been able to pass the legislation they expect. Colleagues, our task here is simple: we must maintain the agenda we promised for our constituents. We will continue to pass legislation that helps instead of hinders. We will pass legislation that finds growth and opportunity in places where it was lacking before and we will pass legislation that sets the frame-work not only for this legislative body, but for the future generation of Iowans who will replace us. We need to remember that the history we make in this chamber does not just affect us in the moment, but will have resonating impact for generations to come.